The 2012 Vuelta a España is heading into it's final week of competition finishing September 9th in Madrid. Le Vuelta is the last Grand Tour of the year and marks the opening season for news of rider transfers, staff changes, and sponsors swapping out. But not too fast, the Vuelta a España [ˈbwelta a esˈpaɲa] is still traveling across Spain and only 22 seconds separates the man in first from the man in second place. Did you know that the Vuelta is the youngest of the Grand Tours? The Tour de France is the oldest and will mark it's hundredth edition in 2013 (the war years saw no competition). Look for a big year at the TDF in 2013 (take a sneak peak at the route, finally the TTT is back!). The schedule of the Grand Tours insure that fans are afforded the highest level of racing throughout the summer. Giro d'Italia - May, Tour de France - July, Vuelta a España - August/September. It is very rare when a single rider is able to compete in all three races. The day-to-day demand is incredible on the body and the 3-4 week recovery time between races inadequate for top performance in all the Grand Tours in the same year, but never say never, miracles happen, records fall. 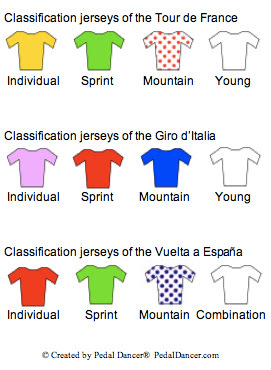 The only jerseys in the Grand Tours that have the same meaning in classification, are the points (green) jersey in the Tour de France and the Vuelta a España, and the (youth) white jersey in the Tour de France and Giro. There is no red and white polka-dot jersey at the Vuelta or Giro, it is uniquely the property of the Tour de France. The white combination jersey of the Vuelta a España, while not unique in color, is unique in meaning. The white combination jersey is awarded to the rider with the best total ranking in all three classifications individual (general), sprint, and mountain. Since 2004, the red and white (combination) jerseys have been won by the same rider. Tour de France: Leaders jersey "maillot jaune" is yellow, sprint (points) jersey is green, mountain jersey is red and white polka-dot, best young rider jersey is white. Vuelta a España: Leaders jersey is red, points is green, mountain is blue and white polka-dot, and white is best total combined points overall/points/mountain. Giro d'Italia: Leader's jersey is pink "maglia rosa", sprint is red, mountain is solid blue, and best young rider is white. All three races were originally started to promote newspaper sales. The Tour de France is solely organized by the privately held company Amaury Sports Organization (A.S.O.). The Vuelta is organized by Unipublic, a company owned jointly by A.S.O. and Groupo Antena 3. The Giro d' Italia is organized by RCS Sports (an Italian publishing and media company). 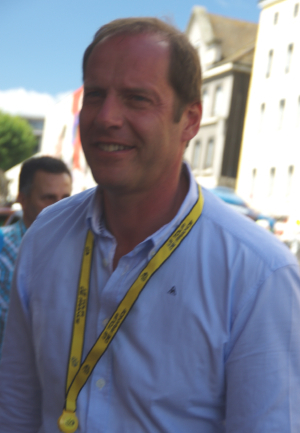 Christian Prudhomme is the Race Director of the Tour de France. Michele Acquarone is Race Directory of the Giro d'Italia. Javier Guillén is the Race Director of the Vuelta. 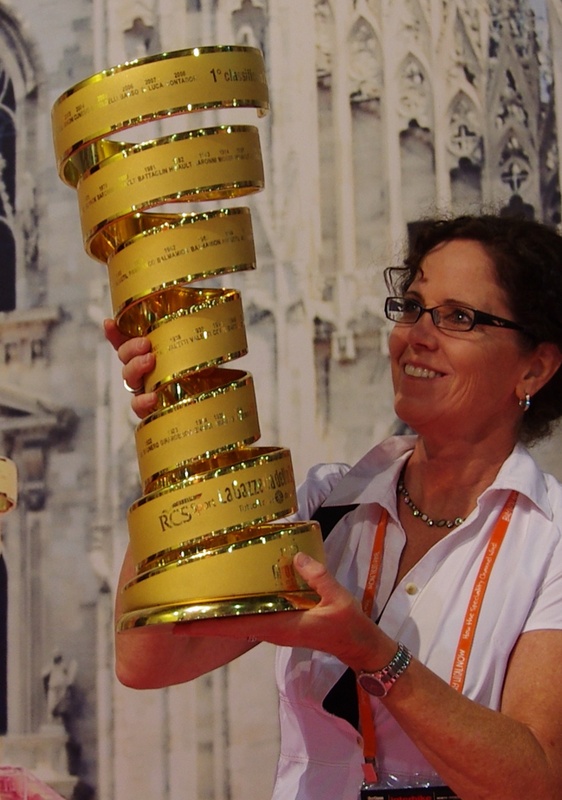 The UCI lists 28 races as part of the 2012 UCI World Tour, three are Grand Tours. Only the three Grand Tours races are allowed by UCI to be longer than 2-weeks in length and must be between 15 and 23 days total including rest days. Each of the Grand Tours are 3-weeks in length, usually containing 2 rest days, but are not always 21 stages. Both the number of stages and the number of teams have varied over the years. Because of the difficulty and prestige, riders who race and win at the Grand Tours, win more money and more UCI points than in other tours or races on the race calendar. Currently leading the World Tour rankings (combining all UCI race points) are: Bradley Wiggins (individual), Spain (nation), Sky Procycling (team). A whopping prize of €450,000 is awarded to the overall winner of the Tour de France, with a total 2 million euros being distributed throughout the 3-weeks of racing. By the time you add prize money for each stage, each classification, best team, and a guaranteed bonus for individual participation, we can understand why being named to the Tour de France team is a big deal for any rider - prestige, money, and a guaranteed hard 3-weeks of riding. Read more at letour.com. Both the Giro and the Vuelta are more secretive about their total prize earnings. The Vuelta trophy changes design, so does the trophy for the Tour de France (although some may say the real trophy is standing on the podium with the Champs-Élysées laid out in the foreground). As the saying goes - win one of the Grand Tours and "you'll never have to pay for your own drink again." Only five riders have won all three Grand Tours in their career: Jacques Anquetil (FRA), Felice Gimondi (ITA), Eddy Merckz (BEL), Bernard Hinault (FRA), and Alberto Contador (ESP). Although no rider has ever won the grand slam winning all three Grand Tours in the same year, seven riders have won both the Giro and the Tour in the same year (considered to be the hardest combination). Two men have won the Tour/Vuelta combo, and three have won the Giro/Vuelta combo. When people speak of the Tour (capitalized), they are referring to the Grand Daddy of them all - the Tour de France. Paris is the most visited city in the Tour de France (followed by Bordeaux and Pau). Milan is the most visited city in the Giro, and the Vuelta favors a finish in Madrid. The record holder for most days in Giro's maglia rosa (77) is Eddy Merckx. Eddy also holds the record for most days (34) in the maillot jaune at the Tour de France. The record holder for most stage wins at the Vuelta (39) is Delio Rodriguez. 2005 is on the books as the fastest Tour de France, averaging 41.5mph over 3592.5 km, up from 25.7mph in 1903 - amazing what a little asphalt will do. And carbon. Don't believe it when people claim the tours are getting so much harder (what the Tours are getting is faster), in 1926 they ran those riders over 5,745 kilometres (3,570 mi) in the Tour de France. In 1910 the organizers first included the brutal stage over 5 Cols in the Pyrenees that has now become a standard route in the Tour de France (Col d'Aubisque. Col du Solour, Col du Tourmalet, Col d'Aspin, Col de Peyresourde, read Five Peaks in One Day?). Back then the roads were not all paved and riders did not have team cars nearby, they also had to carry their own supplies. They did however, have the broom wagon. Online is the best option unless you are lucky enough to be in Spain. For online race viewing please visit the always reliable Steephill.TV links to the Vuelta a España. Or learn how to watch the race on Universal Sports Network.